The new band is now available to all amateurs in Australia that hold an advanced license. The lack of commercial equipment that will operate on this band has deterred many amateurs from getting into LF. This article intends to fill that gap with providing the description of an easy to reproduce transmitter for LF that can be used as a MEPT - Manned Experimental Propagation Transmitter. 12 V power supply - all amateurs have access to one! There is no doubt that the contruction of an antenna system for LF will be a bigger challenge compared to other bands. Fortunately, I believe that the construction of a simple transmitter is in fact easier. The low frequencies are more forgiving in the construction style compared to HF or even worse, VHF and above. The instruments required are simple and affordable by the experimental hobbyist. While large power is required for transcontinental transmission of signals, a few Watts can cover hundreds of kilometres and are easy to manage. The components required are cheap and not specialised for radio use. With the exception of the T94-2 iron dust toroid and the 2.205 MHz crystal, all other components can be purchased from a general electronics store such as Jaycar. Information will be given on how to substitute the two harder-to-get components with alternatives. Also references on where to buy the two components here in Australia will be given. The satisfaction of producing your own transmitter is great and is only amplified by the challenges that are peculiar to the LF band! Finally, a word of warning. This transmitter, even though is is a low power one, can still produce lethal voltages especially when attached to a matching network and a short antenna, as is the case the vast majority of the time. Ensure that you understand the theory before you attempt to reproduce it. Also, ensure that appropriate fuses are placed in circuit for protection when things go bad in the PA section. A 5 A fuse may be a good start but you may wish to reduce that to a lower value, once the system is tuned. In order to produce a simple design, there is no protection against key clicks. This may be a problem when used for normal CW, but I can't imagine it will be a problem when used in QRSS mode. Also, perhaps the super narrow bandwidth antenna that normally connects to such transmitter will take care of key clicks. In any case, this transmitter should be seen as a good starting point and not a fully polished end product. The two photos below show the prototype housed in a salvaged 19 inch rack mountable box and a close up of the prototype board. The two black cables you see coming from the FET heat sink are connected to a thermistor which I use to get an indication of the FET temperature at one of the two panel meters at the front of the box. The meters were there, so I thought I should do something with them. I am planning to put the drain current on the second meter. A CRO. You won't need a fancy one, the standard single channel 10 MHz one will do just fine. For more complex measurements, having two channels may be beneficial. A frequency counter you can trust. If you decide to replicate faithfully this design, you will end up with a transmitter that is very close to the top end of the band - beware of transmitting outside the band! The circuit will be described in three sections - Oscillator, Keying and PA. The objective of the oscillator is to produce a signal in the QRSS segment of the 2200 m band. As you can see in the band plan below, the QRSS segment is in the top 200 Hz of the band, from 137.6 kHz to 137.8 kHz. 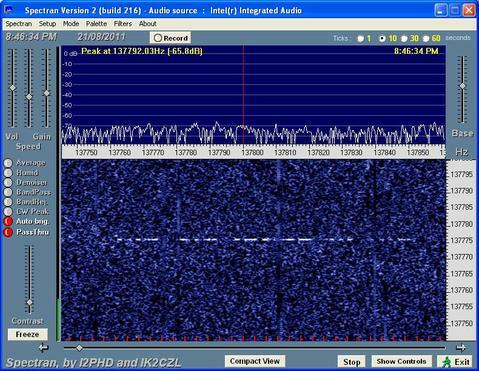 The majority of the DX QRSS happens around 137.777 kHz. The oscillator is based on a single IC, a 74HC4060. 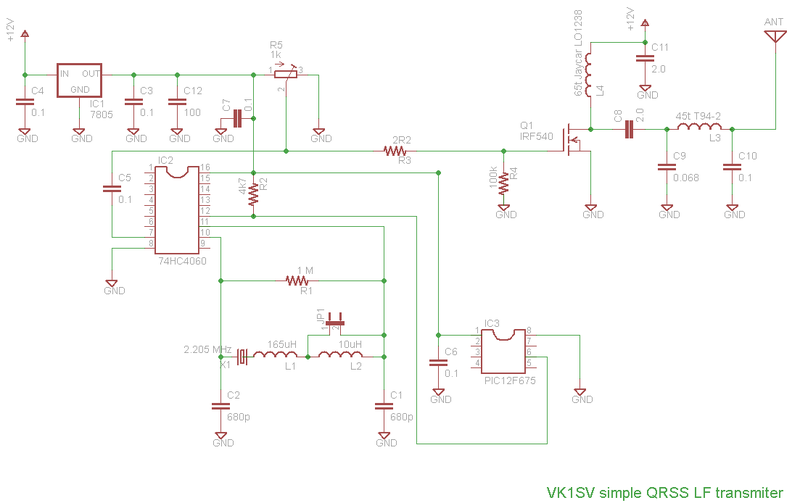 This is a TTL-compatible (0 V to 5 V logic) 14-bit ripple counter which has an oscillator. The oscillator consists of a 2.205 MHz crystal which is divided by the 4060 by 16 to produce the 137 kHz signal. In fact, 2.205 MHz divided by 16 is 137.8125 kHz which is slightly outside the top end of the band. In order to decrease the oscillation frequency, some inductance has been added in series with the crystal. It was found that two 330 uH chokes in parallel will get you roughly where you want to be. An extra, smaller inductor is also in series with the crystal and allows a small change in the frequency. This technique is well known as the art of VXO - variable crystal oscillator. Pin 7 of the 4060 provides us with 1/16 of the oscillator frequency. If you want to use a different crystal which is a multiple of 2.2 MHz, you will need to use a different pin. Consult with the 4060 datasheet which can be found in the Reference section. The output at pin 7 of the 4060 will be a nice 0 V to 5 V square wave. You can check its exact frequency with a frequency counter and adjust to bring it to your desired frequency. The oscillator IC is also the driver of the FET. This is normally not possible but given the very low frequency and the input capacitance of the FET, we can get away with it and therefore end up with a simpler design. The 2.205 MHz crystal was obtained from Futurlec Australia. A CMOS (12V) version of the 4060 can also be used. Keep in mind though, that the CMOS version may be limited in the oscillator frequency it can support. Also, you will need to adjust the signal at the reset pin for keying and the output for driving the FET. Given that I already have a 5 V regulator for the PIC, the TTL version of the counter made more sense. Keying can be done in a number of different ways. If only standard speed Morse code is the requirement, then a standard more key can be connected between pin 12 of the 4060 and the ground. According to the data sheet of 4060, pin 12 is the reset pin and will reset the counter if it is high. Add a pull up resistor in the vicinity of 4.7 kOhm from pin 12 to the 5 V rail in order to ensure that pin 12 is high. Then, when the key is pressed, pin 12 will drop to low and the counter will start counting and produce the 137 kHz signal. Before you try that though, do read the article about key clicks. I am planning to use my transmitter as a QRSS MEPT - it makes sense to use QRSS as it has a huge advantage in terms of S/N compared to normal speed CW - and you will need that advantage in order to cover larger distances! I have used a small microcontroller, a Microchip PIC12F675, purchased from Jaycar. I used a programmer which I also bought some time ago from Jaycar but there are plenty of alternatives available on eBay. The programming tools that I am familiar with are the Microchip MPLAB IDE and the free C compiler CC5X. Below are the four functions needed by the previous program. A reminder, when the pin 6 of the PIC is high (GPIO.1 = 1), the transmitter is OFF, when is low, the transmitter is keyed. Remember, we are setting the pin to high when we are not transmitting and low when we are. Of course, you may use any microcontroller you are familiar with - all you need is a single digital output pin! Another choice for keying would be to use a PC. You may use the parallel port or the control signals of a serial port. Or, you may already have a little ADC/DIO interface. Using the PC has the advantage of being able to generate custom QRSS modulation which will be very handy if you ever need to have a QRSS QSO! A software that can be used to key the transmitter from the PC is ON7YD's QRS software for Windows. As mentioned before, the 4060 IC drives directly the IRF-540N FET. The square wave output of the counter is biased in order to increase the gate voltage and drive the FET to a more efficient state. See next section on the effect of the bias pot R5. The output section is based on DF3LP's design. I removed the air core inductor in order to produce a more compact system, but an air core inductor is a valid option. It is also a good idea if you cannot find a T94-2 toroid. I bought mine from Minikits, but you may come across them on eBay too. The ferrite toroid to the power supply is purchased from Jaycar, part number LO1238. It comes in a pack of two and has 35 mm external diameter. I used an IR IRF-540N FET - beware that other manufacturers may have versions of the 540 that have slightly different characteristics, especially the output capacitance (Coss). Jaycar sells them but eBay may be a cheaper source. This is a component that can fail while making adjustments in the output section, so it's a good idea to have a spare. It's probably worth noticing though that I haven't managed to destroy any FETs in this design so far as it is not really driven to the extreme. Use high voltage rated capacitors at the PA. I would suggest at least a rating of 200 V, at least for the ones in the filter section. Final note, a heat sink will be required to keep the FET nice and cool. Jaycar has a collection of heat sinks that will fit the TO-220 package. The heat sink may get warm or hot. At about 20 W output power, it seems to be fine without any external cooling. Make sure you keep an eye on the temperature of the heat sink while you experiment. The main adjustment is the bias pot R5 which controls the voltage at the gate of the FET. This will determine the output power but also the input power of the transmitter. In order to adjust, disconnect the power to the FET and adjust until there you get 3 V at the FET gate. Ensure the FET is in the switched off state at this gate voltage. Small adjustments may need to be made in the inductor in the low pass filter, at the output section. Instead of trying to reproduce the theory here, I strongly advice the reader to study Paul Harden's (NA5N) article on Class C, D, E and F. Also, the ARRL handbook and the RSGB handbook have detailed descriptions of the theory of amplifiers. The following photo shows the output (trace 1) and the drain (trace 2) waveforms. The following table contains some rough measurements of power and performance. The output power is reduced by reducing the bias voltage by adjusting R5 and driving the FET in the linear section away from saturation. Essentially, by adjusting the bias to the input, one changes the amplifier circuit from Class C (peak of gate waveform in the linear segment) to class D (gate driven to saturation). Some explanation of the table above. The output power (Pout) is measured after a 5-pole Chebyshev filter using the CRO. The input power (Pin) is simply derived by the input voltage (Vin) and the input current (Iin). The efficiency seems to increase as we drive the FET harder and closer to its saturation gate voltage - this is the expected behavior! It is possible to get more power out of this design by increasing the drain voltage. If you decide to do that, keep an eye on the drain voltage as you don't want to exceed 100 V which is the maximum Vds according to the datasheet. Even though the output of this design is a clean looking sine wave, I always use an external low pass filter between the transmitter and the antenna. I have used the online filter calculator provided by WA4DSY to produce a 5-pole Chebyshev LPF with a cutoff frequency of 150 kHz. You can use -2 mix iron dust toroids or air core inductor - mine has air core inductors. As mentioned in the introduction, beware of the voltages at the different sections of the trasmitter. At the drain, which is also the heat sink, you will have about 50 V peak voltage. The output voltage will be about 100 V peak to peak on a 50 Ohm load. The voltage will be much higher after the variometer at the antenna feeding point. In this page, there is a description of the variometer I currently use with this transmitter. You can see my signal on 137.776 kc and VK2XV on 137.760 kc. The fuzzy spectrogram below is from Dale VK3DB in Moe, Victoria (400 km). This is skywave propagation and as such, the strength of my signal may increase thoughout the night and will probably peak just before sunrise. I would like to acknowledge Dale VK1DSH, Ian VK1IS, Steve VK2XV and Nick VK2DX for their valuable feedback. Valuable advice has also been found in discussions in the lofexp and 600m mailing lists.